A news story on PA TV accused Israel of using chemicals to erode the foundations of Al-Aqsa Mosque in order to cause it to collapse. A news story on Palestinian Authority television recently accused Israel of using chemicals to erode the foundations of Al-Aqsa Mosque in order to cause it to collapse, according to Palestinian Media Watch. The report stated that, “he emphasized that this [Israeli] attack on the Al-Aqsa mosque is the most audacious of the last three years, and that ever since Jerusalem was declared a capital of Arab culture in 2009, the occupation authorities have embarked on a dramatic offensive to Judaize the city and utterly erase its original [Arab] landmarks,” according to PMW. In 2009, then PA Chief Religious Justice Tayseer Tamimi claimed that Al-Aqsa is "hanging in midair" due to Israel's injecting "chemical acids" to dissolve the mosque's foundations. "The [Israeli] excavations' purpose is to destroy the Al-Aqsa Mosque. In fact, its foundations have been removed,” he claimed. 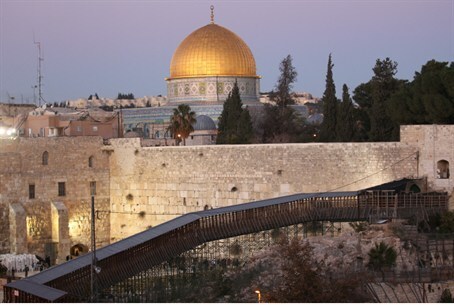 “There is an Israeli plan to destroy the Al-Aqsa Mosque and to build the Temple,” he said. Israeli Arab Islamic leader, Raed Salah, head of the northern branch of the Islamic movement in Israel, reiterated this same libel on PA TV in July. “The Israeli occupation sees itself in the stage of the final countdown before the building of the legendary false holy Temple at the expense of the Al-Aqsa Mosque," he alleged.